Why Choose This First Aid Program? 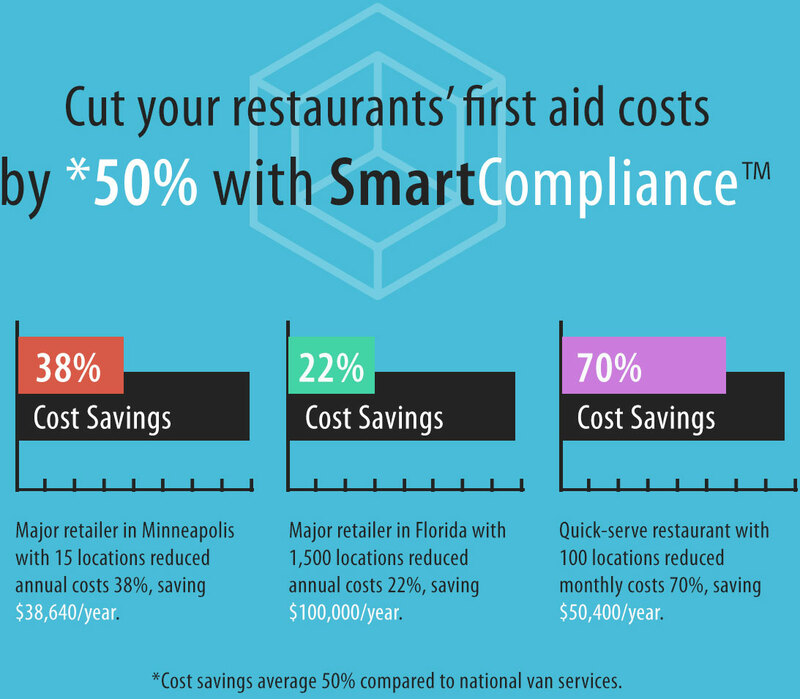 Avoid fees and penalties due to noncompliance and ensure your restaurant meets or exceeds ANSI and OSHA standards. Save money without sacrificing quality. Cost savings average 50% compared to national van services. First aid kits can accommodate small to large food establishments and contain supplies specifically for food preparation and processing. 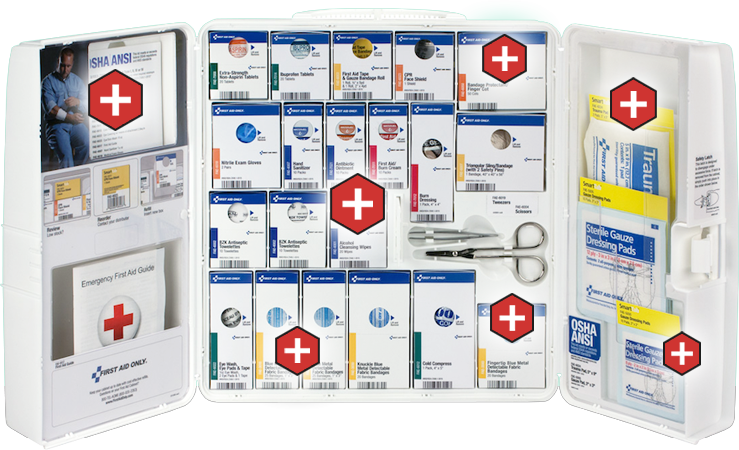 Expansion pocket and snap-in boxes let you customize your first aid cabinet to meet your specific needs. Patented SmartTab indicator tab alerts you when supplies are low and puts reorder information at your fingertips. Patented snap-in boxes help reduce pilferage and product loss, saving you money in restocking items and shipping costs. Always have what you need when you need it and easily manage first aid supplies over multiple locations. Compartments are clearly labeled and color-coded to keep first aid supplies organized and easy to locate. Never worry about expired first aid supplies. You choose what items to stock, so never-used inventory can be eliminated. All first aid supplies are manufactured with the highest standards and achieve hospital or industrial-grade quality. 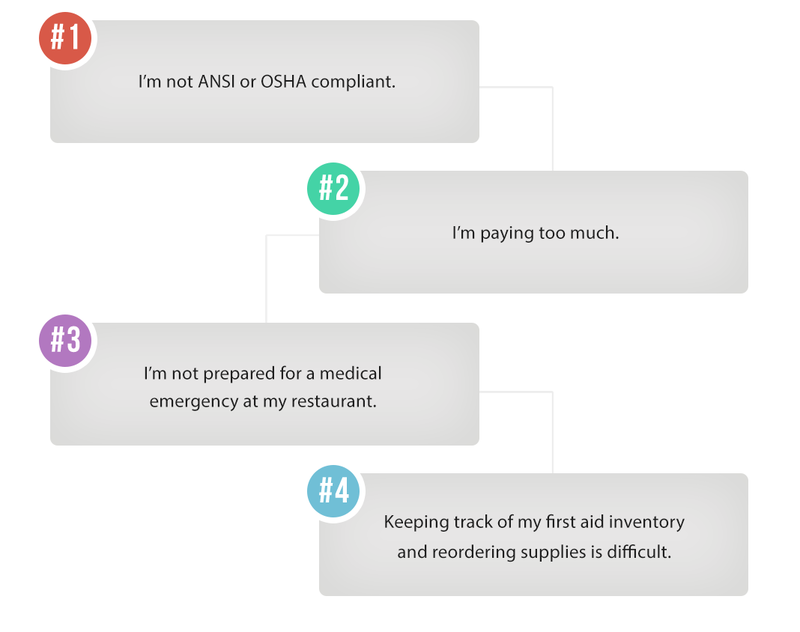 Evaluate your potential workplace hazards to determine what first aid solution fits you best. Browse our first aid product catalog online or talk to our customer service reps for a custom solution. We ship your first aid supplies to your doorstep. It’s that simple. READY TO MAKE RESTAURANT LIFE EASY?